Come fall, butternut squash seem to be falling the sky, they’re everywhere. And with good reason. There’s a lot of great things you can do with them, but first you need to get through that tough skin. There are a couple options, both of which I’m demonstrate here. You can use a traditional vegetable peeler, but I sometimes find the skin either too tough, or the peeler too dull to move quickly. So I’ve also shown you how to remove the skin with a knife. First, the skin is quite thick and a peeler may not go deep enough with one swipe. 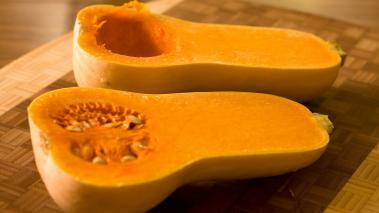 If you don't get down to the vibrant yellow flesh immediately, go over the squash again to remove another layer. Second, the shape makes peeling tough. I like to hold the rounder end, and peel off the longer thinner side first. Once the skin comes off, the squash gets pretty slippery to hold and I like to get as much off as possible while I still have a good grip. My preferred method for peeling a butternut squash (and what I show in the video) is to use a knife.